As you know, the value of your list is powerful. We’ve recently discussed the importance of building a list. In order to truly utilize the power that is available to you through your list, you must first know and understand how to make your list work for you. #1 Being consistent. There’s a reason I put this first. It is the most crucial way to build relationships with your potential clients and customers. Think about the current relationships in your life. If you didn’t consistently, which means on a regular basis, communicate with those people then you wouldn’t have much of a relationship with them, now would you? The same is true for those on your list. They aren’t going to get to know you, or even know who you are at all for that matter, if you don’t consistently communicate with them. Decide when you’re going to send your emails, newsletters, or ezines and do so consistently. #2 Providing valuable information. Another way to make your mailing list work for you is to provide valuable content and information to your readers. This begins before they even opt in to your list through your free offer. You want your free offer to be something of high value and provide great content for your readers so that they will be eager to receive more from you. This way, when they get the follow-up emails you send or your weekly newsletters they will be excited to open them. #3 Utilizing your autoresponders. 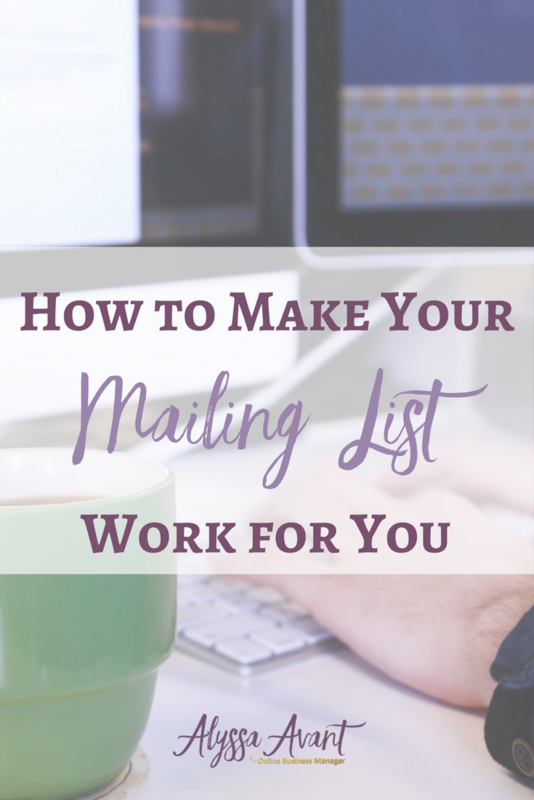 Your mailing list can work for you even when you’re not working. The autoresponder is how you make that happen. You can load up your autoresponders with promotional emails, follow-up emails, and more to automatically, or what I like to call automagically, work for you. These autoresponders can send a series of emails to every person on your list dripped out over days, weeks, or months after they opt in to your list initially. This keeps you in front of your potential clients more often and builds your relationship. Obviously, there are more ways to utilize your mailing list and get it to work for you, but these three ways will definitely give you a starting point. If you want to learn more about list building or need help setting up your first opt-in contact me to learn more!